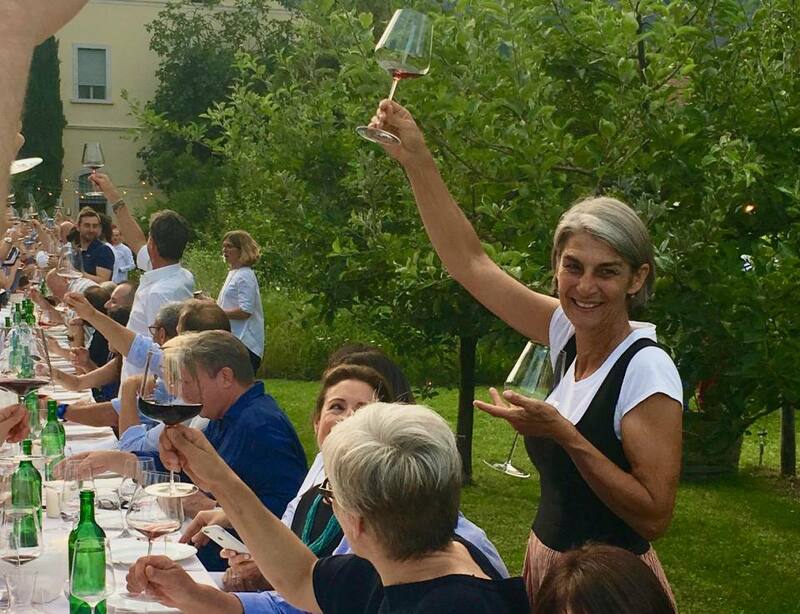 On Monday, May 30, Elisabetta Foradori organized an extraordinary event with 65 artisan, terroir winegrowers and their wines. Senza Filtro in Italian conveys the idea that the wines are immediate, vivacious, true expressions of place (terroir). To have those characteristics, the wines, by definition, have to be made “naturally”, but the event was not a “natural” wine event per se. Four groups (I Dolomitici, CoViBio, Les Caves de Pyrene and Renaissance Italia) brought wines along with a handful of other winegrowers. (Full list) There were winegrowers I knew and had written about, some with new wines, and many I had read or heard about but hadn’t had a chance to meet or visit. At the end of the day, I attended a comparative tasting of Teroldego and Lagrein wines led by Heinrich Meyr of Nusserhof and Elisabetta Foradori. Here are some of the highlights. Giusto Occhipinti (read more on blog) brought his and Tita Cilia’s new entry: a dry white made with 100% Zibbibo (Muscat di Alessandria), an aromatic, native Sicilian variety. The grapes ferment in clay amphorae and remain there with the skins for 11 months.The result is a zesty, fresh wine: dry from the minerality of the soil but full of aromas. I hope Giusto names and labels it before summer because it would be great as an aperitivo or to eat with spicy summer dishes. Heinrich and Elda Mayr, historic producers primarily of wines made with the native variety, Lagrein, were pouring two wines that were new to me. The first was a dry white, 100% Blaterle (native white variety on the verge of extinction). At 1,100 bottles, they are the world’s largest producer. The second was a 100% Lagrein vinified as a white with only the briefest skin contact.The result is a lovely fresh rosé that pairs well with food. The Mayrs explained was for 300 years the way Lagrein was vinified. It has only been recently in the last 30 years that Lagrein has been made as a full bodied red. Antonello Canonico was pouring the wines from high altitude vineyards that he and two friends, Dino Briglio and Emilio Di Ciann, purchased from local farmers and converted to organic production ten years ago. They use local varieties for whites (Pecorello, Mantonico, Garnaccia Bianca–Grenache Bianco), rosé (Magliocco) and reds (Magliocco, Garnaccia Nera—Grenache Nero or Alicante). The sapidity, lightness and elegance of the wines was astounding. 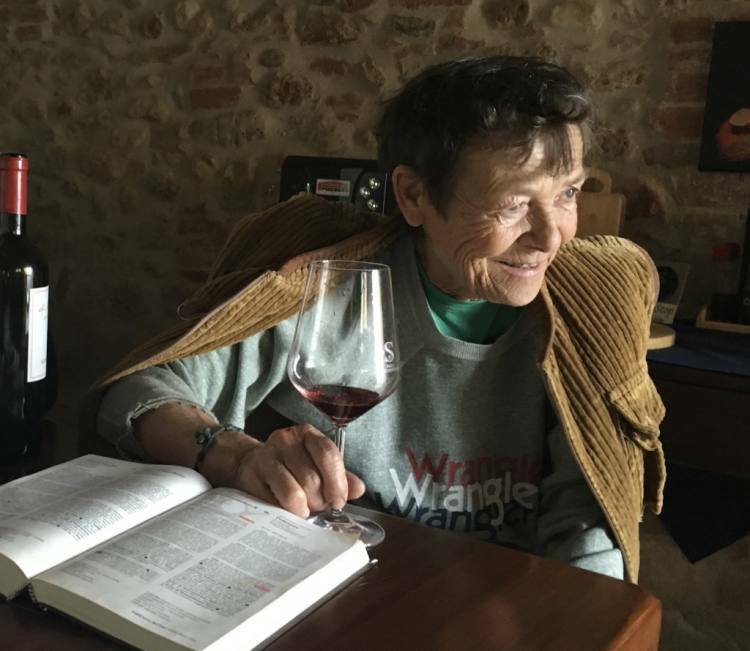 Elisabetta Foradori’s 35-hectare estate in Toscana has been a place for her to experiment with different grape varieties, altitudes, soil and climate. Davide, who was pouring, gave me tastes of the newest: 100% Carignano from the Campo al Finocchio vineyard that ferments and rests 8 months in cement tanks. A French grape variety, generally known for abundant growth more than quality, Carignano has traditionally been used a secondary variety to add color, tannins and acidity. This version is drinkable like the flagship of Ampeleia, Ampeleia Un Litro, and in the style of Marco Tait, who manages the estate. 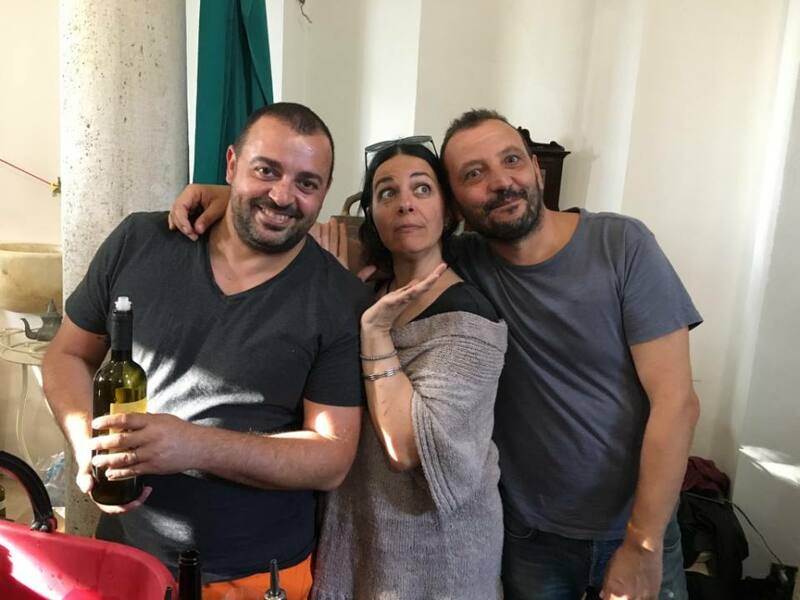 Gianfranco and Francesca Masiero, with their daughter, were pouring a new white wine, Lazaro, made 100% from Garganega, the native variety used for Soave wine that is often bland. But Lazaro was something altogether different, full of vitality and flavor. Gianfranco explained, “We used all the experience we have in making red wine to making a white.” The grapes are grown in calcareous soil. Some ferment in stainless steel, some in cement, all with three months of skin contact. Afterwards, they age in large, old wood barrels and in the bottle. The result is a dry, fresh wine with structure, but not oxidized like an orange wine. Fantastic. Twelve of the forty members of the biodynamic (and then some) organization of Nicholas Joly offered wine. 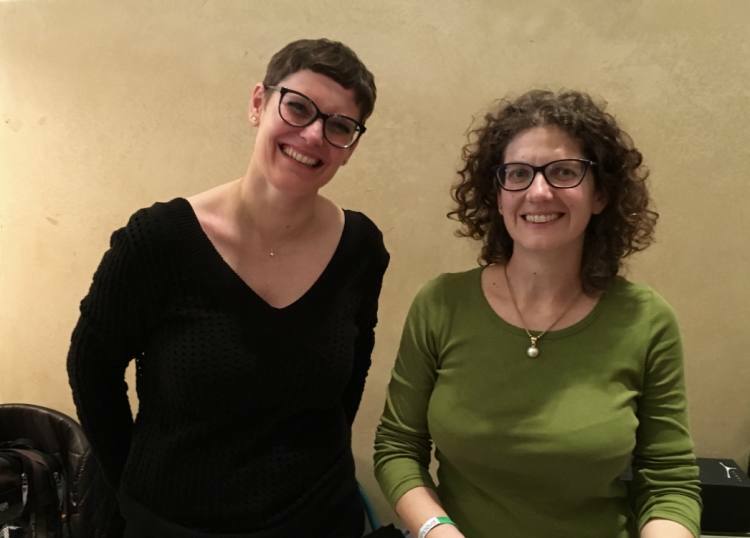 Nicoletta Bocca of San Fereolo was pouring her Dolcetto as well as Riesling/Gewurtztraminer wines from high altitude vineyards in Piemonte, which I’m going to see next week. There were favorites such as Emidio Pepe, Tenuta di Valgiano and Montesecondo and Cascina degli Ulivi along with winegrowers, who were new to me. Giuseppe Ferrura enthusiastically poured his Fabbrica di San Martino Rosso (Sangiovese, Ciliegiolo, Canaiolo, Colorino) and Fabbrica di San Martino Bianco (Vermentino, Malvasia, Trebbiano). Originally a restauranteur, he and his wife, Giovanna Tronci, began making wine in 1999 on a family estate that dates back to the 1700s. The classic Tuscan varieties come alive in these wines which are certified both organic and biodynamic. Not surprisingly they seem to have the appealing exuberance of the winegrower. 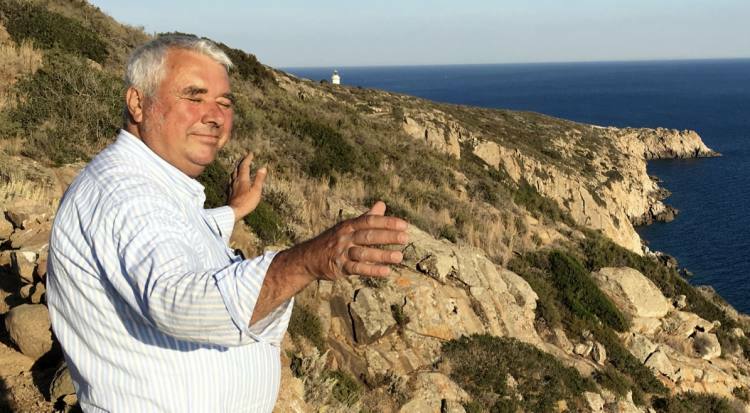 Olivier Paul-Morandi, who had a previous career in the European Parliament in Brussels, began with a one hectare vineyard near the sea in southern Tuscany and has gradually expanded. His six-year old son, Matteo, was with him and this wine’s name is the first word he said: D’Acco. It is 100% Alicante (Grenache Nero) and was first made in 2013. When he started in 2010, Olivier worked briefly with a winemaker but quickly began working on his own as owner, vineyard planter and tender, and cellar master. His solitary pursuits are leading to interesting results. Carlo Venturini poured each of his wines for me with such humility that at first, I didn’t understand he was the winegrower. They are versions of the Veneto classics (Valpolicella, Valpolicella Superiore and Amarone) made with Corvina, Corvinone, Rondinella and Molinari native varieties, but they stand far out of the crowd of “the usual”. The Valpolicella was clean, fresh and easy drinking for an every day wine but still full of character from the rich biodynamic soil and old vines. The Valpolicella Superiore was not a “ripasso” but had its own pleasing complexity and structure. The Amarone “Stropa” was the most different in that it was almost crunchy with wild cherry bursting through the structure . Gabriele da Prato began making wine in 1999 on his family’s estate where winemaking had been mostly forgotten. 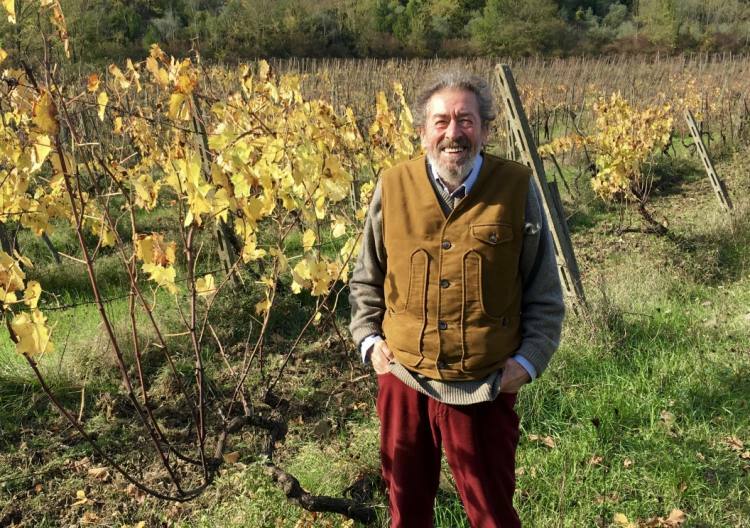 With the help of Saverio Petrilli of Tenuta di Valgiano, he brought vitality back to some of the highest altitude vineyards in Tuscany. He has a strong love of French varieties, which happen to grow happily in his terroir: Chenin Blanc, Syrah and Pinot Noir. For the 2014 Syrah called Melograno, the grapes were foot pressed and fermented in open containers outdoors to accentuate the light energy in the grapes. The result is a spicy but not heavy version of Syrah. Fascinating. Based in the UK, this importer curates a broad selection of organic/biodynamic/natural wines. They were pouring the wines of 19 different winegrowers, many of whom were not present, but whom I plan to visit soon. Paolo Veglio was one of the few winegrowers, who was present at the event. He decided to begin bottling his own wine in 2004 in very small production (about 10,000 bottles). Previously, his family had sold to Bruno Giacosa. I tasted both his Barbaresco and Riserva, which are made according to the most traditional methods. Amazing. 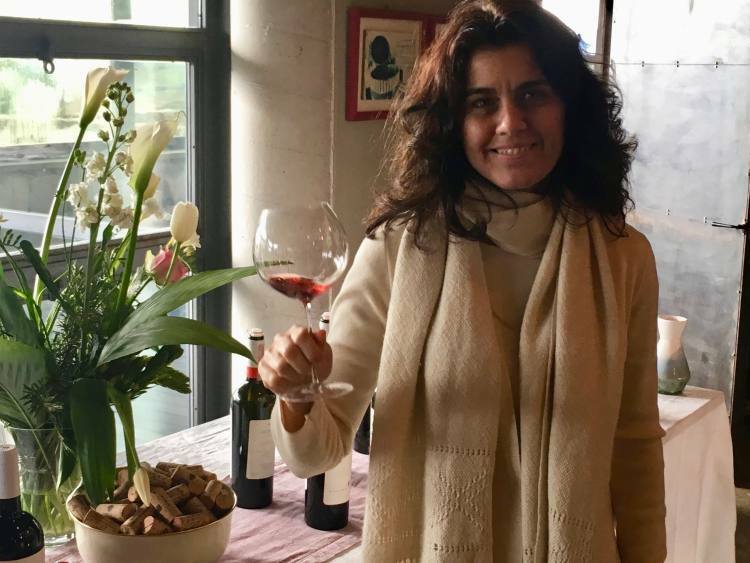 Elisabetta Foradori helped organize and served as president of this group of ten winegrowers, eight of whom joined Foradori at the event: Castel Noarna, Cesconi, Elisabetta Dalzoccaio, Eugenio Rosi, Francesco Poli, Maso Furli, Vignaiolo Fanti and Vilar. All are in small production, made naturally and with a strong attention to expressing the characteristics of their particular place and climate. My favorites were the wines made with native varieties. Here Vignaioli Fanti poured his Manzoni Bianco, fresh and clean but characteristically aromatic. The day had a wonderfully collegial and friendly feel to it…all in the Foradori cantina courtyard where palm trees grow under steep mountain slopes. That was one more reminder of how remarkably diverse and rich Italy is in terms of terroir. I just returned from Calabria where I tasted wines from L’Acino, and I agree with you, Eleanor. The wines are delicious especially the Toccomagliocco from the 100% Magliocco.